APC Smart UPS are trusted by millions of IT professionals throughout the world to protect equipment and critical data from costly interruptions by supplying reliable, network-grade power reliably and efficiently. APC UPS in Dubai, UAE is Available in a variety of forms factors and classes, there is a model for nearly every application and budget. Standard models are the most popular UPS in the world for business servers, storage and network devices and have long been considered the benchmark for reliability and manageability. 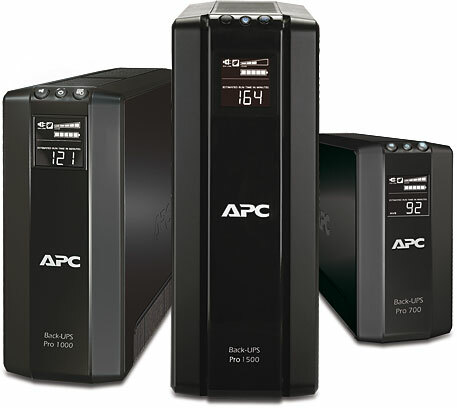 APC UPS, Batteries and accessories distributor in Dubai. Entry level APC Smart-UPS models are an economical choice for small and medium businesses looking to protect small networking devices, point-of-sale (POS) equipment and entry level servers. The extended run models accept external battery packs for long runtime to power critical servers, security and communication systems through outages that could last hours. APC Smart-UPS Online, upgraded to offer higher efficiency with more management options. In response to the growing importance of maintaining 100% network uptime, Schneider Electric has enhanced the Smart-UPS Online to address today’s IT demands. Available from 1000V – 20kVA, the Smart-UPS Online provides best in class power protection for a wide range of applications.The APC Smart-UPS On-Line is a high density, double online conversion UPS with scalable runtime. The double online topology means the UPS has an internal bypass. When it detects a failure with the UPS or battery, the APC Smart-UPS Online automatically switches over to utility power without dropping the load.The APC Smart-UPS On-Line provides high-density, double-conversion online power protection for servers, voice/data networks, medical labs, and light industrial applications. The APC Smart-UPS VT offers compact three-phase power protection with excellent efficiency and scalable runtime for small data centers and other business critical applications.APC Smart-UPS VT offers centralized three-phase power protection with the reliability of the award winning Smart-UPS family. Ideal for small data centers, large retail stores, regional offices, and dense power requirements, the Smart-UPS VT includes dual-mains input, automatic and maintenance bypasses, and scalable runtime for increased availability. The rack mounted version maximizes valuable floor space by incorporating UPS, power distribution, and additional battery capacity in a single rack. Low cost of ownership is achieved through best-in-class efficiency and a reduction in rating of electrical infrastructure – wires, transformers, and generators through the Smart-UPS VT’s Soft Start feature. The APC Network Management Card with temperature monitoring provides remote monitoring and management through a simple Web/SNMP interface and provides integration with InfraStruXure® Manager. Serviceability is greatly enhanced by user-replaceable batteries, manageable extended run frames and included start-up and standard onsite warranty services. All these features make the Smart-UPS VT the easiest UPS in its class to deploy, manage and maintain. The APC Symmetra MW is 400-1600kVA ultra energy efficient, modular, scalable, 3 phase UPS power protection with industry-leading performance for large data centers and mission-critical environments. Symmetra MW redefines high-power UPS technology as a modular, fault-tolerant UPS in the 400-1600 kilowatt range. Ideal for large data centers, complete buildings, healthcare and other critical facility protection requirements, the Symmetra MW can be scaled for rigorous and changing electrical demands. Symmetra MW provides increased availability through internal N+1 configurability, predictive failure notification and multi-module paralleling features. Setting a new standard for low cost of ownership, Symmetra MW delivers best-in-class efficiency and a reduction in rating of electrical infrastructure- wires, transformers and generators. Slide-in/out power modules, manageable external batteries and self-diagnosing features greatly reduce mean time to repair, and lithium-ion battery solutions reduce battery maintenance and cost. Symmetra MW provides a customizable system in a standardized design for any large on-demand network-critical physical infrastructure. APC UPS Management Efficient management of your UPS is critical. We provide the entire line of APC by Schneider Electric UPS Management products providing a wide array of management solutions specifically tailored to your IT environment and its supporting physical infrastructure.Our APC UPS Management solutions control and monitor UPSs locally and remotely. We carry the most popular AP9617 UPS Network Management Card and AP96919 UPS Network Management Card with Environmental Monitoring. Browse the models below to view a sampling of our best sellers. Buy APC SMART UPS in Dubai, UAE Abu Dhabi, Sharjah, Ajman, Ras Al Khaimah, Fujairah, Fujairah, Al Ain and Africa.